Along with being a board certified surgical ophthalmologist, Dr. Samir Shah is also an educator. 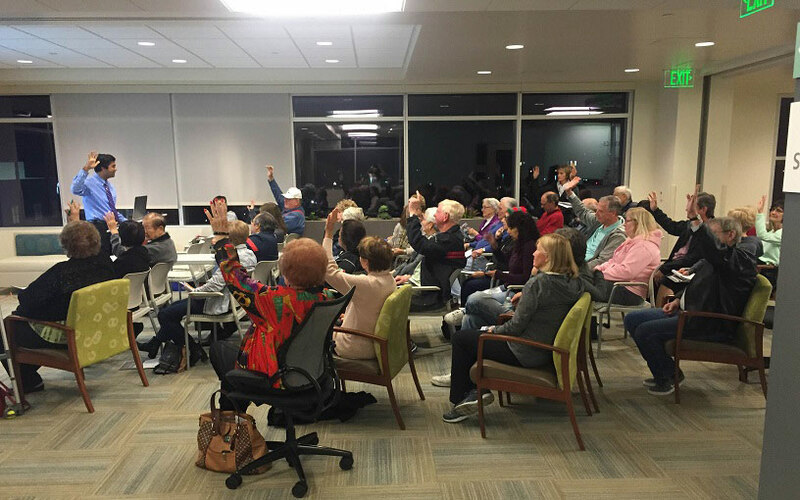 Recently, Dr. Shah conducted a seminar on cataract surgery with the patients of Hoag Hospital. Dr. Shah reviewed the causes, symptoms and treatment options of cataract surgery. 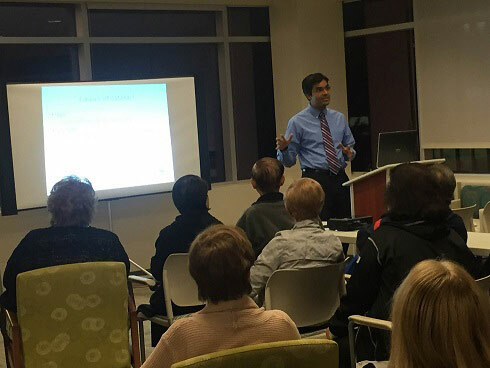 As a cataract surgeon himself, Dr. Shah was able to answer all the questions patients had during the seminar. At Beach Eye Medical Group, we love to engage with and give back to our community. Call us to schedule your cataract consultation today! Patients who have been diagnosed with cataracts are often left with a tough choice: to undergo surgery or let the disease take its natural course. A cataract is defined as a clouding of the part of the eye that is called the lens. People living with cataracts often report blurry vision, described as though they are seeing through a fogged-up window. Aging is the main culprit, with the National Eye Institute reporting that half of Americans aged 80 are affected by the disease. Other risk factors include diabetes, smoking or overexposure to ultraviolet light. Cataract removal is one of the most common surgeries done at Beach Eye Medical Group, with offices in Huntington Beach and Irvine, California. It is known to be one of the safest and most effective surgeries, with 90% of patients reporting better vision after the surgery. A recent study published by the American Academy of Ophthalmology may hold the key to helping patients and their physicians make the right choice. After comparing the lifespan of patients who had undergone cataract surgery vs. those who chose otherwise, the study concluded that patients who had the surgery lived significantly longer. Furthermore, researchers found that the long-time mortality risk is 40% lower for patients post cataract surgery. This data was drawn from the Blue Mountain Eye Study, a population-based study of vision and common eye diseases among an elderly Australian population. A total of 354 participants aged 49 years and above were involved in the study. Everyone in the group had a cataract-related vision impairment and a handful had undergone surgical intervention. The assessments were done between 1992 and 2007. Risk factors such as age, gender, and diseases such as hypertension, heart disease, obesity, as well as lifestyle factors such as smoking and drinking were taken into account during data analysis. Improvement in physical and emotional well-being. After surgery, patients felt that they are able to go back to doing their daily activities without risk of injury to themselves and others. Greater independence. Patients report that after the cataract surgery, they are now able to independently perform tasks that previously required assistance. Increased optimism. The elderly often have a hard time adjusting to not being as active as they once were. With cataract surgery, they have a new, positive outlook on life as they are able to enjoy doing the things that they love. Increased compliance with medications. One of the most harmful effects of blurred vision is that patients are not able to correctly read prescriptions, which results in a decrease in medication compliance. With cataract surgery, patients are able to correctly read their prescriptions and take their medication properly. The study argues that there is a great advantage to choosing cataract surgery. It is safe, effective and has minimal risk to the patient, especially when performed by a qualified team of physicians and eye care specialists such as the Beach Eye Medical Group. If you live near Huntington Beach or Irvine, California, drop by one of our clinics to learn more about how you can improve your quality of life through cataract surgery.